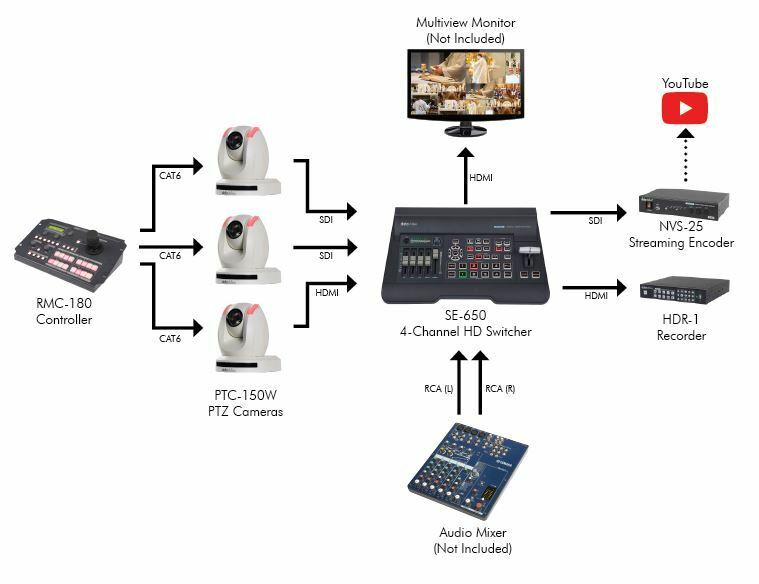 Here's a very good example of a PTZ150 with controller, SE-650 video mixer, web streamer and recorder. Pastor Phil's Workflow includes everything needed to produce a worship program on the web. By introducing the production to online streaming, users may discover that there are more people interested in watching the sermon than ever before. This includes viewers who may not have been able to attend the gathering in person because of various reasons, whether those reasons were physical or logistical, or otherwise. Now, they can watch the pastor using a computer or a smart TV or even a smart phone by visiting the YouTube channel during the service. In addition, The HDR-1 recorder in Pastor Phil's Workflow allows the house of worship to record sermons in H.264 MP4 format. This provides an easy pathway for uploads to the church's website.